Playing the Cello "Naturally"? Ask Your Hands How. In the early stages of teaching cello to a beginner, any good teacher is concerned with shaping the student's hands in a rational manner, i.e. fingers curved and not buckled, joints flexible and not locked. 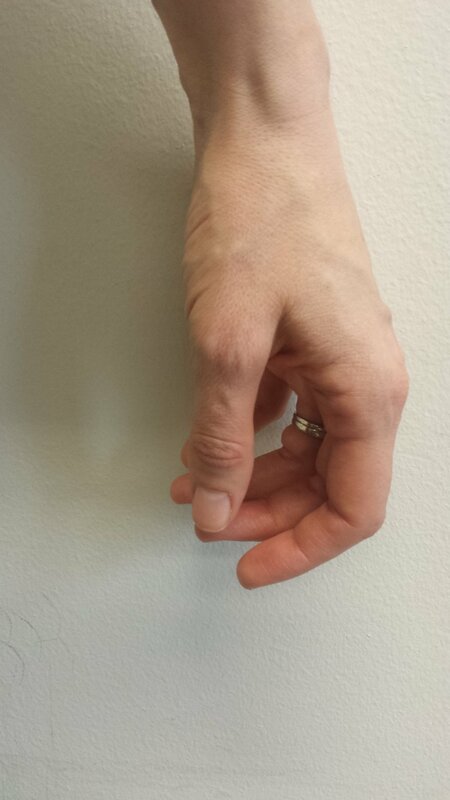 The most relaxed and natural state for our hands and arms to be in is hanging loosely by our sides. Here are four different views of my left hand doing just this. The fingers are naturally spaced. The amount of spacing varies a lot between individuals. The fingers want to hang down in a slanted way. ...and the last step is to replicate this with your cello. The thumb touches the neck of the cello "sideways" rather than flat on the pad. This prevents a student pushing the pad of the thumb into the neck, buckling the top joint, creating tension and inhibiting ease of shifting. Now let's do the same thing with the right hand. Newer PostWant Better Tone on Low Notes? Play Them An Octave Higher.